Yearbook classifieds for Ozark yearbooks are listed below. If you want to see if others from Ozark, MO high schools want to make a trade for a yearbook, post your info below. Ozark High School alumni can relive their experiences from high school by sharing memories and pictures, reconnecting with those alumni listed, and more. My yearbook(s) were lost in a house fire. If anyone knows of a 1973 or 1974 yearbook, please let me know. Thank you. 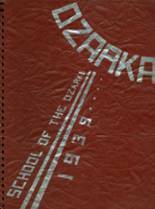 I was enrolled at Ozark HS for the last quarter of the year (1972) only. I have a feeling my photo wasn't in the yearbook.